Spring is when the sap starts to rise and the buckets and syrup lines come out! What is sap? Simply put, sap is the sugar that trees produce and store over winter months. In the spring, with the right day and night temperatures the sap starts to rise, bringing energy and life back to the tree to produce leaf and flower buds. By tapping trees, either with the old fashioned buckets, or newer pipelines, we can collect the sap on its way up the tree, and then cook it down into sweet, delicious syrup. Sugar Maple (Acer saccharum) trees are named just for that reason. They have a sweet sap which when cooked down produces syrup which can range in color based on how it is processed. Come celebrate the official start of the Maple Syrup Season by learning how maple trees are tapped and then tap your own! Free hot chocolate and donuts! Maple Candy & Cream making demonstrations most Sundays at the Log Cabin on the square. Syrup making demonstrations, weather permitting. Tucked between winter and spring is ‘Sugaring Season’. Its length varies and is totally dependent on Mother Nature, and it is definitely one of the sweetest seasons in which to visit. 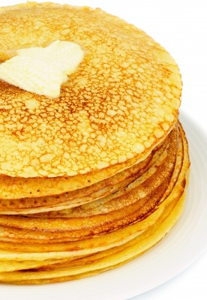 AYCE Pancakes (plain, blueberry, apple) Sausage or bacon, home fries, eggs, toast and OJ, coffee or tea. Children’s portions available.